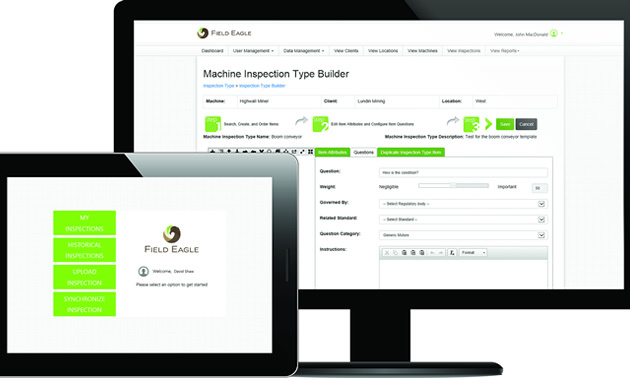 Home Blog Field Eagle: "Groundbreaking software for inspections"
Field Eagle: "Groundbreaking software for inspections"
Field Eagle is a field inspection software that allows you to create paperless, risk based inspections. Earlier today, Field Eagle was featured in an article written by Mining & Exploration, a mining publication location in British Columbia. The article was written by Karen Kornelsen, and outlines the features, benefits and uses for field eagle. Click here to read the article. Field Eagle is beneficial for companies as a whole, inspectors enjoy the ease of use, and efficiency in reporting allowing them to do more inspections in a day. CEO’s and managers enjoys the benefit to their bottom line – saving them time, money and preventative maintenance.